Artists: Jim Cheung, Jerome Opena, Dustin Weaver, Mike Deodato, Stefano Castelli, Leinil Francis Yu, et. al. …as they are usually designed as pure marketing events rather than brilliant pieces of comics or graphic novels. They tend to have dozens of prequels (as this one has), dozens of spin-offs (as this one has) and dozens of sequels (as this one has, too). And the overall aim is – guess what? To have incredible big numbers of subscribers, incredible big sales volumes and to generate tons of cash. …But this one is different in that it is exceptionally well written and beautifully drawn. It is quite a complex cinematic super hero action series and without having deeper knowledge of the recent developments in the Avengers and New Avengers continuity it is quite difficult to get behind whats going on here. Actually, it took me more than say 150 pages out of a total of 632. And more than once I had to get back and reread stuff that was mentioned earlier on. To summarize: Our galaxy is under attack by extremely powerful and aggressive extraterrestrials called the Builders. These guys due to their far advanced technology can create and destroy whole planets just like that. And for some reason I have forgotten they just have the intention to destroy Earth. Therefore, an extended group of superheroes led by Captain America and the Avengers joined by the secret group of the Illuminati assemble and join forces with the armies of the Galactic Counsel to face the enemy deep in Space. 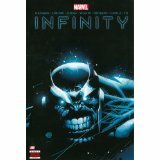 While they are out, a well known long term villain of the Marvel universe, the mad Thanos of Titan, plans an invasion on Earth. He has reason to believe that one of his unbeloved sons is living on Earth on an undercover basis. Therefore, he moves his troups to conquer Earth, find his son and kill him eventually. The problem is that Earth’s defense is more or less limited to Iron Man and Mr. Fantastic who have stayed home while the others are fighting the Builders. As you can imagine, this all leads to a lot of colorful action and a lot of battlefields in outer space, on different planets and on Earth. …due to Jonathan Hickman’s ability to orchestrate this complex super-action story with lots of sub-plots or sub-archs in a fast moving way without losing the reader or boring him at any point. Except for the difficulties initially to get up to speed the reader will find it hard to stop reading. This is of course, if you like super hero action comics. If not go read somethig else.